You will notice cracks, some small and some larger, in your rustic log furniture. This occurs naturally in the drying process and adds to the character and rustic look of our products. These cracks, which are known as checking and can sometimes extend to the center of the log, do not diminish the function or design of our rustic log furniture. All rustic log furniture is subject to the natural process of "checking".  Checking, or cracking, happens as wood releases moisture, and normally occurs across or through the annual growth rings. It is the usual result of wood seasoning. It is important to know that we dry our logs in a large heated room for months to ensure that 99% of all "checking" is already done before we use it to build log furniture. All logs are stress tested before they enter production to ensure that they will hold up to the test of weight and time. This way when we package your rustic log furniture you will know that you will not have to worry about the durability of the rustic log furniture. Not all companies do this, but you can rest assured that all log furniture found on our site goes through this rigorous testing process. Your safety and satisfaction is very important to us. Checking occurs mainly on the surface of the wood and does not affect the structural performance or integrity of the wood. This natural process adds to the uniqueness of the pieces and lends it that certain rustic appeal that has become so popular in home and garden decor. The degree of checking will vary from product to product and from log to log. This is rustic log furniture and imperfections in the wood such as checking and knots are expected. Checking can range from very slight slivers to cracks running the full length of the log to the heart (middle of the log) of the wood. In either case this checking is completely normal and in no way affects the integrity of the wood or the strength of the furniture. Remember that all of our logs are stress tested to ensure that they will hold up to the test of weight and time. On top of that all our rustic log furniture is of course warranted from the manufacturer. As always, if you have questions or concerns, please do not hesitate to contact us. Some of our rustic log furniture is "German peeled", as opposed to hand-sanded. That means it will be slightly rough to the touch, even if finished. We do offer hand-sanding as an additional option, and we also carry a line of furniture that is always hand-sanded.